First, as described previously in this column, the emergency regulations and other features of military control in the south are intended not to ensure legality but only to give its appearance. Thus, the keeping of such records is a perfunctory exercise; not one to which the authors feel genuinely bound. Secondly, as a corollary of the first, the army’s detention of Madi and the others was a strategic imperative, not a legal one. The men were among hundreds of people picked up over a number of days and described as suspected perpetrators of bombings and shootings. Whether or not there was evidence against them was not particularly important; the main concern was to “separate the fish from the water”. Having done that, when the maximum period of 37 days in army detention without charge was up, something else had to be done to keep them from swimming away. And if it couldn’t be coercive, then, just as injustice can be legalized, duress could be made voluntary. Madi and the others were offered a choice, of sorts: join four-month training camps or face criminal charges and remain in custody to await trial. Naturally, over 300 opted for the camps, situated in some provinces to the north. But when almost a hundred inmates asked to be allowed to visit their homes at the start of October, they found that the training wasn’t so voluntary after all: they were refused, even after submitting written requests. 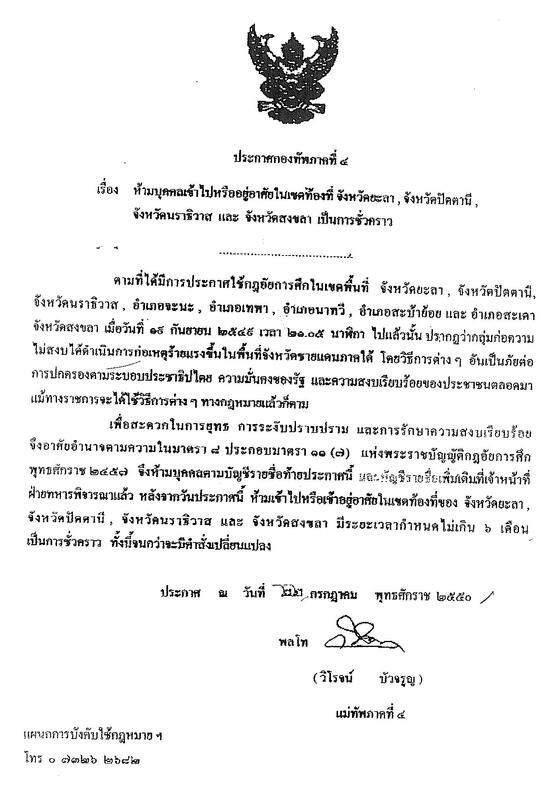 Thereafter, relatives simultaneously petitioned courts in the provinces where they were being held–Surat Thani, Ranong and Chumpon–under section 90 of the Criminal Procedure Code, concerning unlawful detention. Section 90 is Thailand’s equivalent of the habeas corpus writ in common law. But unlike habeas corpus, it is infrequently used. Law students are unlikely to get instructed about it. Lawyers and judges alike seem uncertain about its applicability, and struggle to familiarize themselves with precedents. This in itself says a lot about the practice of law and understanding of civil rights in Thailand. In his seminal work on the English constitution, A. V. Dicey considered that the right to issue a writ of habeas corpus “determines the whole relation of the judicial body towards the executive”. Dicey rated the importance of the habeas corpus petition far above written constitutional guarantees of rights because it can be exercised at any time to obtain an immediate remedy to a definite wrong. By contrast, constitutional rights on paper are in many territories not readily enforced. They are also easily suspended–as happened again in Thailand on September 19. So the October petitions were significant not only when viewed against the backdrop of violence in the south but also with regards to Thailand’s entire legal system. The findings of the three courts on October 30 appear to have been, like many other human rights judgments in Thailand, both pragmatic and contradictory. They concluded that the army had not illegally detained the men, as it had organized the camps in keeping with martial law and had not treated them like prisoners; however, were it to deny anyone the right to leave the camps then this would be unlawful. Thus, the men were free to go, and the army too, free from blame, despite the testimonies of detainees that they had indeed been held against their will and the acknowledgment of army personnel in court that they had told the men that they either could be trained or be charged with non-bailable offences. But the question of whether or not any of the men had actually committed a crime, in which case they should be charged anyhow–or not, in which case they should not have been threatened with such charges–seems to have been left unanswered. As section 90 verdicts are uncommon, these should be widely distributed and keenly scrutinized. No doubt, much greater scope exists for use of this article of law in Thailand, not only to protect detainees, but more broadly, to shape the relationship between the judiciary and executive. Meanwhile, the released men are still unable to go home. There remains another obstacle – an order of the regional army commander issued in July, prohibiting them from entering any of the four southernmost provinces for six months – yet another way of keeping the fish out of the water. At the time of writing, the prospects for the men’s return were still being negotiated. The army has allowed them three days to make another funny choice – continue with the training and be allowed to go back in November, or exercise their rights under the courts’ orders, and wait until next January to go home. The men in Chumphon are still thinking it over. Those in Surat Thani and Ranong have not bothered to spend any more time contemplating bogus alternatives: they have gone already. This entry was posted in army, courts, human rights, military, rule of law, Thailand, UPI and tagged 4th Army Region, Chumpon, Criminal Procedure Code, Dicey, Emergency Decree, habeas corpus, Madi Alilatay, Martial Law, Ranong, section 90, Surat Thani, Yala. Bookmark the permalink.